"It's remarkable that we've now seen for the first time a physical object from outside our Solar System," says lead author Dr. Alan Jackson, a postdoc at the Centre for Planetary Sciences at the University of Toronto Scarborough in Ontario, Canada. "Major questions about 'Oumuamua remain." -Yes like for instance why would alien aggressors want to build a vessel poorly disguised as a rock and send through our system disgourging clouds of nanobots for our destruction? And isn't that the only question we need to ask? ...why would alien aggressors want to build a vessel poorly disguised as a rock and send through our system disgourging clouds of nanobots for our destruction? Maybe it was a slow day, or maybe they had a surplus of nanobots which if they didn't use they were going to loose some of next year's alien-conquest budget? 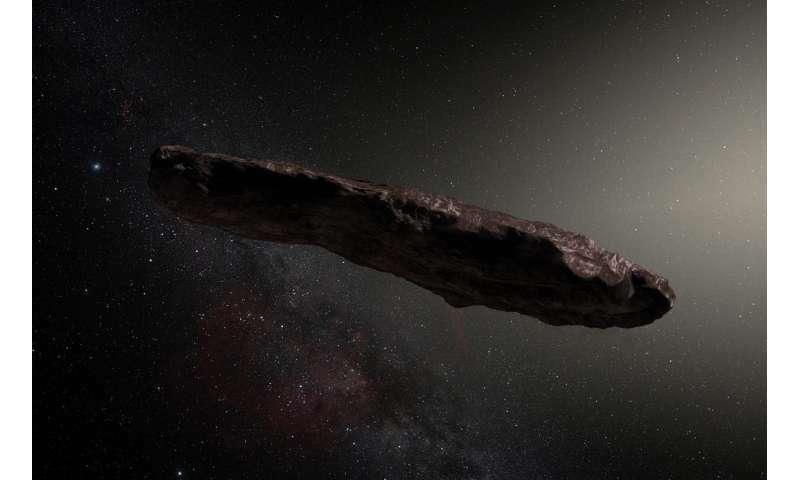 I'm guesstimating that Oumuamua is actually a Cosmic Titan's thrown-away stogie! In this case P(Observation|Binary) and P(Binary) are higher than single star systems. Most star systems are binary, so yeah, its likely.